I sin andra symfoni tar Mahler sönder universum och sätter ihop det igen. (...) Jag vet ingen dirigent från de senaste decennierna av denna apokalyptiska symfoni som lika självklart som Eschenbach hanterar det dramatiska förloppet: uppladdningarna, de expansiva utbrotten, de lugna partierna däremellan. In 'Urlicht' there's a palpable presence in the brass chorales, and Eschenbach's (...) sensitive mezzo, Yvonne Naef, breaks up the long phrases he demands with intelligence, and conveys warm human sympathy throughout. This is a first-rate performance and recording of Mahler's "Resurrection" Symphony, easily out-classing most of the recent additions to the catalog. (...) I place it (...) among my highest recommendations in any medium. Yes, there are 93 Mahler Seconds, but this one belongs in your collection. It's message (...) is glorious. The first movement captures lightning in a bottle unlike anything since the live, 1951 Otto Klemperer outing with the Concertgebouw Orchestra of Amsterdam. Everything else about the performance - chorus, soloists, and well-rounded sound quality - puts the Philadelphia set among the finest recordings of this oft-heard symphony. Kein Zweifel: dies ist eine der persönlichsten, am tiefsten empfundenen Interpretationen von Gustav Mahlers Zweiter Symphonie! (...) Eschenbach, der ruhige, der besonnene, der tief schürfende Dirigent, baut Mahlers gewaltige Architektur sehr geduldig zusammen und erzielt so eine grossartige Wirkung (...). Yvonne Naef (...) turns in one of the finest accounts of the fourth movement ("Urlicht") on disc. (...) The first movement has a rugged intensity that recalls Klemperer, and the insanely powerful, crushing brass chords that usher in the recapitulation have to be heard to be believed. Here is another case where taking a risk pays off: Eschenbach really slams on the brakes here, and if you're going to do that the brass had better blow their collective lips off - and so they do. (...) The playing of the Philadelphia Orchestra is pretty outstanding. Music for the soul - One of the great Mahler conductors of our time, Christoph Eschenbach has a particularly close connection to the spiritual spheres of pain and relief in the music of Gustav Mahler. His recording of the Sixth Symphony, with The Philadelphia Orchestra, was hailed by Gramophone as “maybe the Sixth of first choice, sonically and interpretatively,” and ClassicsToday.com stated, "No Mahlerian will want to miss it!” (ODE 1084-5D). 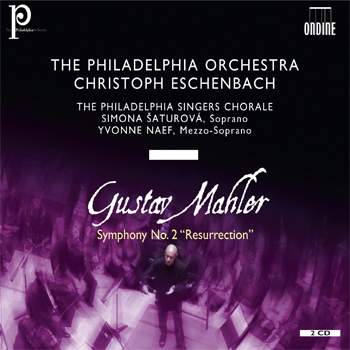 This new release features the Second Symphony ("Resurrection"), which was one of Mahler's most popular and successful works during his lifetime. The celestial "Urlicht" song of the fourth movement is performed by the celebrated mezzo-soprano Yvonne Naef. The famous chorus of the Finale ("Auferstehung") features Simona Šaturová and Yvonne Naef with The Philadelphia Singers Chorale.